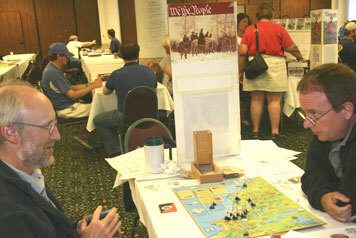 Despite its age as the granddaddy of the CDWs, the We the People demo hosted by George Young draws many interested new players. 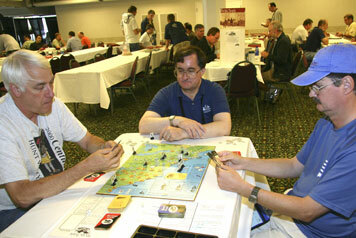 Ray Freeman and Scott Fenn, veteran gamers of other titles, compete in the beginner's bracket of WTP under tutelage of Randy Mac Innis. Seven of our 39 players were new or inexperienced. These folks had a separate, coached bracket, with support provided by Randall MacInnis and Ron Fedin. Otherwise, the tournament used the same format as in previous years. Three swiss rounds of qualifying games were used to reduce the field to a final eight, who then advanced through a single elimination gauntlet to produce a winner. As usual, after the first three rounds, we had four undefeated players and five worthies with 2-1 records, as well as the winner of the coached bracket, so a fourth round was added to reduce the field to eight. In the quarter final match-ups, we again played with special tournament rules that allowed the British player to win ties if the American player bid for the privilege. This meant that, as long as Canada remained British, they only needed to take five colonies, not the normal six. Paul Gaberson's British were defeated by Bill Peeck's Americans. 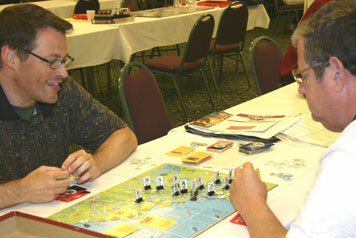 Eric Kleist, playing the Americans with a bid of only 1, defeated Ray Freeman. Ray had advanced to the quarter finals by winning the coached event, then defeating Mike Ussery in the play-in round. Joe Collinson managed to knock off two-time champ Brian Mountford. And in the only pairing of undefeated players, George Young outlasted another two-time champion, Marvin Birnbaum. Significantly, in all of the quarter final match-ups, the Americans won, with bids ranging from 1 to 4. The semi-finals broke the colonial string of victories; with the British successful in both matches. Eric Kleist, who had had success with the British throughout the tournament, continued his run with the redcoats, relegating Joe Collinson to third for the second straight year. George Young likewise took advantage of a bid of 4 by Bill Peeck, to knock off the Americans. In the Final, Eric Kleist took the British yet again, with a bid of 3. Eric played the New England strategy, focusing on taking the four New England states plus Delaware. The match was finally decided in 1782 -- in this turn, the British finally managed to take all of New England. Unfortunately, to do this, they had left Canada defenseless. The Americans took advantage of the absence of forces to capture Montreal and Quebec, giving the US the necessary nine colonies. Significantly, despite the fact that the game lasted to 1782, neither the French Alliance nor the Declaration of Independence occurred. 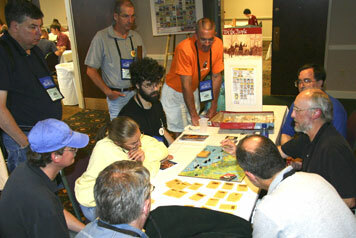 The majority of games were played using a bid of 3 for the Americans. The American edge in these games was 18 to 5. Bids of 4 reduced the edge to 5 to 3. Interestingly, 4-5 years ago, bids were typically 1 or 2. Even though players have significantly increased bids in recent years, the American advantage still exists. George Young on the way to his third WTP title. Brian Mountford battles Pat Mirk in the qualifying rounds. Congratulations to Dan Leader for winning the second PBeM We the People Tournament. Leader, who was a relative unknown among veteran WTP circles, compiled a perfect 6-0 score in the six-round Swiss format. He defeated, in order, Kevin Klemme, Brian Mountford, Ken Gutermuth, Pete Reese, James ("The Master") Pei and Henry Rice and recorded an impressive four wins as the British along the way (the Americans are generally thought to have a not inconsiderable edge in the game). Check out the final standings here: http://mysite.verizon.net/vze4bc94/wethepeople/index.html. The tournament began in the Spring of 2006 with 50 players (including five past WBC champs) and was played via ACTS. A total of 133 games were played with the British winning 44 games (17 were automatic victories), Americans winning 74 and 15 games being draws. The average bid to play the Americans was 2.93 PC markers added at the start of play, which given the poor 33% British win percentage should probably have been higher. The best British player was the Champ with his perfect slate of four wins. The best American player was Bill Peeck (five wins against a lone loss), who was able to avoid playing the British entirely (shame on his opponents for not bidding him up!). The best sportsman was Andrew Maly, who cheerfully compiled a "perfect" 0-6 record. 1775: The British had a definite advantage in strategy cards with five ops cards to only three for the Americans (plus Jane McCrae). As usual, most cards were used to place PC markers on both sides, but the final British move put Cornwallis in Delaware poised to disperse Congress in the beginning of the new year. The British achieved control of NC, VA, DE and MA. 1776: This time the Americans had the card advantage with a total of seven ops cards to five for the British. Because Cornwallis could not be easily stopped from taking Philadelphia, the Americans elected to go first to get some PC markers down. Cornwallis dutifully dispersed Congress, but his attempt to capture Maryland was rebuffed, resulting in his retreat to York without an army. With Washington still in New England, Clinton ended the turn by moving from Delaware to New York to convert NY to the British and put some pressure on Washington. SC and NY were added to the British total. 1777: Clinton's harassing move to New York increased greatly in importance when the British were dealt both the major and a minor campaign. Starting the year with the major campaign, all exits from New England were successfully sealed off, trapping Washington inside. However, Greene was still in Newport to provide support, and the Americans still controlled much of the area. Despite having only three ops cards, the Americans made excellent defensive moves to prevent Washington's capture. Several battles raged back and forth, particularly in New Haven, with the Americans holding the tactical advantage but Washington still unable to escape. An attempt at a British flanking move by landing Burgoyne in Barnstable resulted in nothing but winter attrition losses. However, NH was added to the British fold and Arnold was lost to treason. 1778: At last, Washington was able to break out on the second card play when Howe's attempt at a counterattack to reseal the barrier was defeated. Washington immediately headed south to Philadelphia. With all British generals but Cornwallis in New England and Cornwallis in York without an army, the situation quickly looked promising for the Americans to reclaim mid-Atlantic and southern states. Cornwallis picked up a CU that had been left in Baltimore and was subsequently reinforced while the Americans put new armies into Virginia and North Carolina, retaking Virginia. The DOI provided extra help for the Americans. On the last play of the year, Cornwallis attempted to capture Maryland by advancing to Fredericktown from an American PC marker. He was home-free as long as Lee couldn't intercept. However, the interception roll was the needed "1", and with the battle cards 4-6 for the Americans, the Americans amazingly managed to match all four British cards and win the battle, capturing Cornwallis. 1779: The deck had not yet been reshuffled and four "War Ends" cards had already been played. Both "War Ends in 1779" and the French Alliance cards were still in the deck and likely to be drawn. The British player had neither. But, the British were blessed with both the last remaining minor campaign and "Lord North Royal Amnesty", two killer cards, and could afford to lose some ground and still win. American armies continued to operate in North Carolina, so Cornwallis moved south, leaving a CU in Norfolk and recapturing New Bern to isolate a pocket of American PCs. When the Americans played the "War Ends" card, it was time for decision. The Americans had been saving the French Alliance card for a late flanking move into North or South Carolina, but the move by Cornwallis thwarted the advance, and Lord North protected British PCs from isolation in the south. Washington recaptured Delaware, but it was not enough. In the end, the British pulled out the victory by controlling SC, NC, NY, RI, MA, NH, and Canada.